This pair of stunning floor lamps with metal construction and crystal glass accents is sure to add an elegant touch to your living space. Perfect for the minimalist home, this set of two simple yet charming floor lamps will fill your living room with light -- and style. The crystal glass details, including the finial, are carefully crafted, adding a subtle elegance to the design. Each takes one maximum 150 watt standard-medium base bulb (not included). On-off socket switches. 8-foot long silver cords. A handsome pair of floor lamps from the 360 Lighting brand. Polished steel finish. Metal construction. Crystal glass accents on each pole. White fabric drum shades with ball finials. Looking for simple yet elegant floor lamps for my new sitting room. Plus, the daily special pricing was great! Now I can’t wait to see if these were really a bargain. To use in in the bedroom & bedroom. Looking for the crystal, silver look, great price for 2 & reviews were great! I really liked the offer of two lamps at this price, an excellent price! I know they will look great in my living room. Thanks, Lamp Plus for having this offers. When I saw these lamps I knew I was done searching. I am happy! May I put an LED Bulb on this lamp? BEST ANSWER: Yes, that’s what I use. These lamps are gorgeous and very classy! I get many compliments on them! Enjoy! 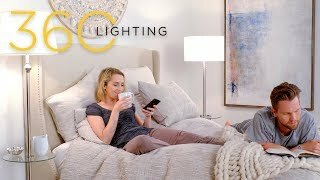 Do you sell Floor lamps with USB connections? BEST ANSWER: I have added a link below to some currently available USB floor lamps. Do these lamps qualify for free return shipping? The Best buy ever !!! Great for the price, buy it you don’t gonna regret. They are elegant and beautiful. These lamps are beautiful, what I like most is the unique style, they look great in my formal living room. Very good quality and value. The poles need slightly better alignment though, after many attempts to join them, one of the lamps has an ever so slightly tilt. Luckily, I was able to position it to where it's not noticeable. GREAT DEAL , Easy To Put Together. Very lovely lamps. Look amazing in my home. Perfect for my living room! I was looking for floor lamps for my living room that went with the new foyer/hall and dining room lights I purchased. These were perfect. Beautiful chrome and crystal lights that were simple but elegant! I love them. These lamps are well priced and beautiful! They look just like the pictures and are easy to assemble. Very happy with them. The lamps are beautiful. Love them. Beautiful and elegant did I mention perfection? I purchased a set for my studio and couldn't be any happier. They are beautiful. They really brighten up my place. The crystal stands out. The white lamp shades also looks great. I would buy them again. So glad I ordered these, very pretty and easy to put together! Love the lamps. The are very stylish and a perfect addition to our home. It is the perfect amount of light.